Chana Masala Dosa - Masala Dosa is a famous South Indian breakfast generally served with potato masala filling. 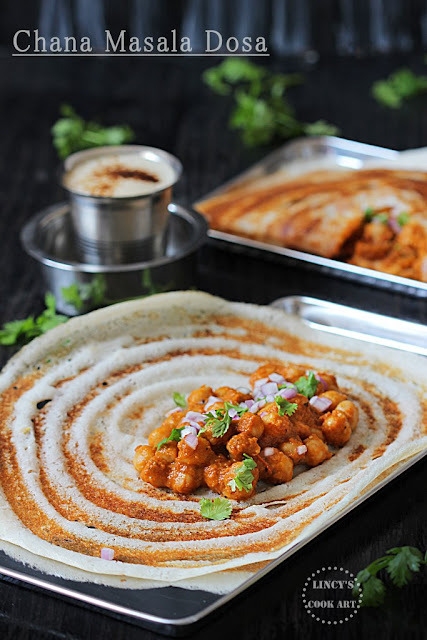 Nowadays we find varieties in this masala dosa with some other healthy ingredients such as peas, cauliflower, paneer, channa etc. Today i have come up with a tasty masala dosa which is rich in protein. You could also make this instantly by using tinned chickpeas. Well regards to the taste of the dosa it does not require any side dish like chutney or sambar as it is spicy. You could serve with any chutney or samabar of your choice. Easy tasty healthy filling breakfast. Kids too love the chana filling. We loved this masala dosa and i have to say it taste so yum. Do try this healthy dosa! Soak the chana over night or minimum 6 hours and pressure cook it with some salt for 3 whistles till soft and reserve the cooked water. Heat 3 teaspoons of oil in a pan and add the chopped onion, ginger and garlic together and saute for fifteen to thirty seconds till the raw flavour from them leaves and slightly cooks. Now add the tomatoes and cook for few minutes till it starts to become mushy. Switch off the gas and allow the mixture to cool. Transfer the mixture on a blender jar and add pepper corns and fennel seeds and grind as a fine puree; set aside. Heat 3 teaspoons of oil in a pan an fry jeera, cinnamon, cloves and bay leaf. Once the garam masala roasted and gets the flavour add the ground puree and mix well and cook till the oil starts to separate on sides. Add the chilli powder, coriander powder and garam masal powder and mix well; cook for fifteen seconds to releive the raw flavour of the masala. Then add the channa cooked water/ water for about one and half cups and allow the mixture to boil well. Once the mixture starts to bubble add the cooked chana and salt; mix well. Cook till the gravy starts to thicken. Crush kasuri methi with hand and sprinkle over the curry and mix well; switch off the gas. sprinkle some coriander leaves. Heat a dosa tawa and grease it wil oil. Add a big ladle full of dosa batter and make concentric circles. Drizzle half a teaspoon of oil and roast the dosas till crisp. Once the dosa almost cooked add the chana masala and sprinkle some chopped onions and fold the dosa like a triangule or fold in to half. Serve hot with any kind of chutneys or sambar. I feel like I am a restaurant... what presentation, lincy!